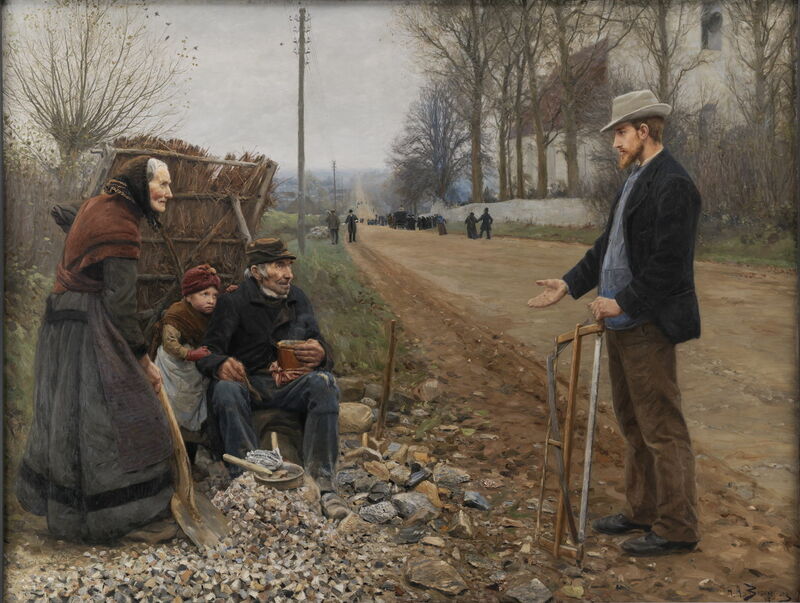 Hans Andersen Brendekilde (1857–1942), People by a Road (1893), oil on canvas, 200 x 263 cm, Statens Museum for Kunst (Den Kongelige Malerisamling), Copenhagen, Denmark. Wikimedia Commons. By the end of the 1880s, Hans Andersen Brendekilde (1857–1942) was still a good friend of L A Ring, but the latter spent more of his time with the Wilde family. Brendekilde had also been making good progress exhibiting at Charlottenborg, and 1889 completed what must be his best-known work. Hans Andersen Brendekilde (1857–1942), Worn Out (1889), oil on canvas, 207 x 270 cm, Fyns Kunstmuseum, Odense, Denmark. Wikimedia Commons. 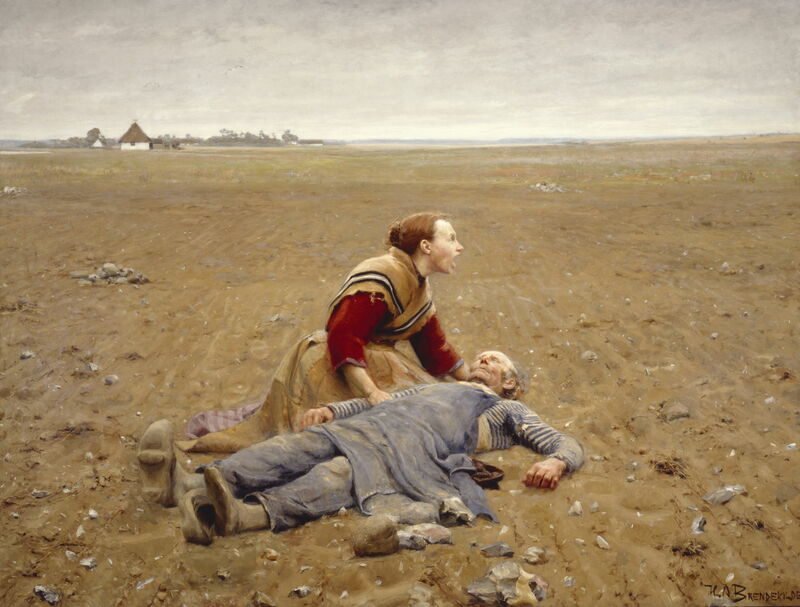 Worn Out (1889) is a painting which follows in the tradition of Jules Bastien-Lepage. An old man has collapsed when working in the fields. A younger woman, perhaps his daughter, is giving him aid and shouting for all she’s worth to summon assistance. The soil around them is poor, and full of flints; the two were engaged in the toil of the poorest of the poor, picking out the large stones and putting them into piles for collection. It’s backbreaking work for the young, and clearly too much for this man. Brendekilde used Bastien-Lepage’s formula for this type of Naturalist painting: the horizon is high, the view appears wide-angle, and in the foreground the detail is meticulous. The two figures form a triangle, a classically strong compositional geometry. This is one of the few paintings which can evoke sound – that of the woman’s voice bellowing out over its unforgiving flat field. That year, Brendekilde was awarded an academic scholarship to travel, and visited Germany, France, Switzerland, Italy, and from there on to Egypt, Palestine, and Syria. I am sure that he painted many more works than I have been able to find during this period of over a year, but hope this small selection is representative. Hans Andersen Brendekilde (1857–1942), Jerusalem from the South East (1890), oil on canvas, 43.2 x 73.8 cm, location not known. Wikimedia Commons. 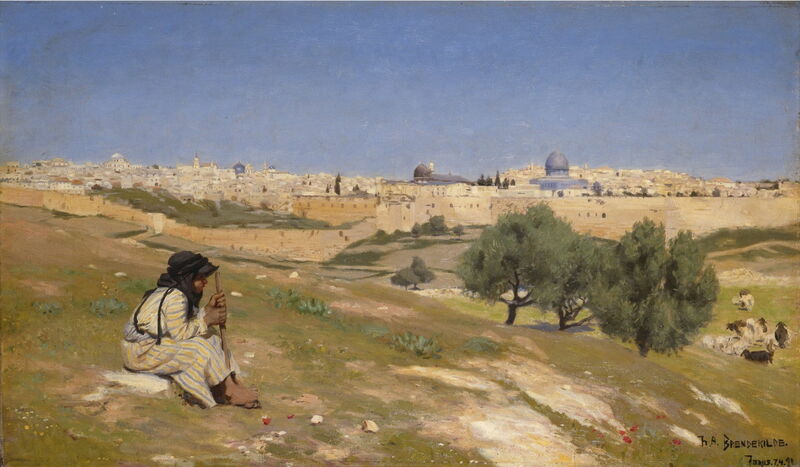 Brendekilde painted this wonderful view of Jerusalem from the South East on 7 April 1890, apparently en plein air. It is the middle of the day, and he sat a young Arab shepherd on the hillside to provide a foreground figure. 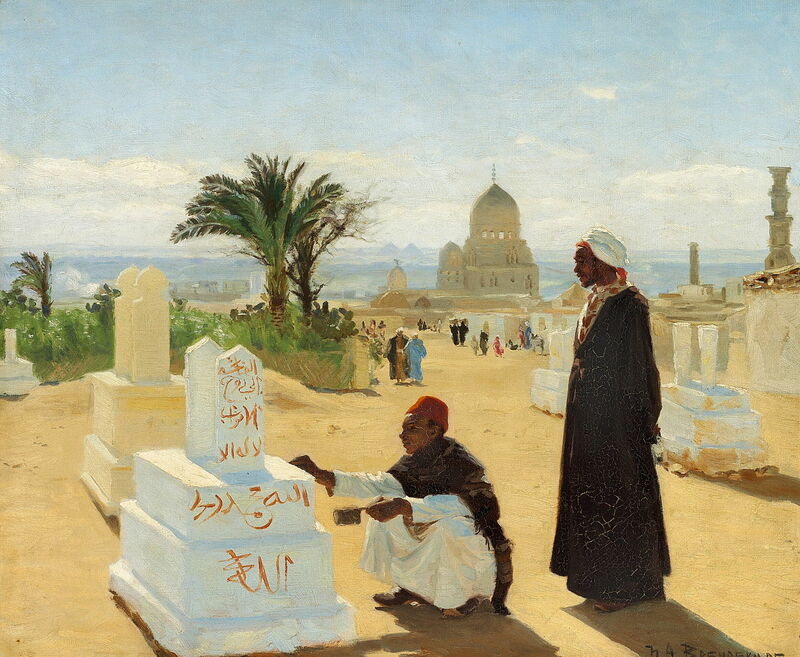 Hans Andersen Brendekilde (1857–1942), The Graves of the Apostles Jacob and Zacharias near Cairo (1889-91), oil on canvas, 46 x 55cm, location not known. Wikimedia Commons. At some time during or after his travels, he painted The Graves of the Apostles Jacob and Zacharias near Cairo (1889-91). These appear to be in a cemetery on a hill above the city, amd the pyramids can be seen on the skyline. This painting was exhibited at Charlottenborg in 1891. Hans Andersen Brendekilde (1857–1942), Oriental Scene with the Pyramids of Giza in the Background (c 1890), oil on canvas, 141 x 105 cm, location not known. Wikimedia Commons. 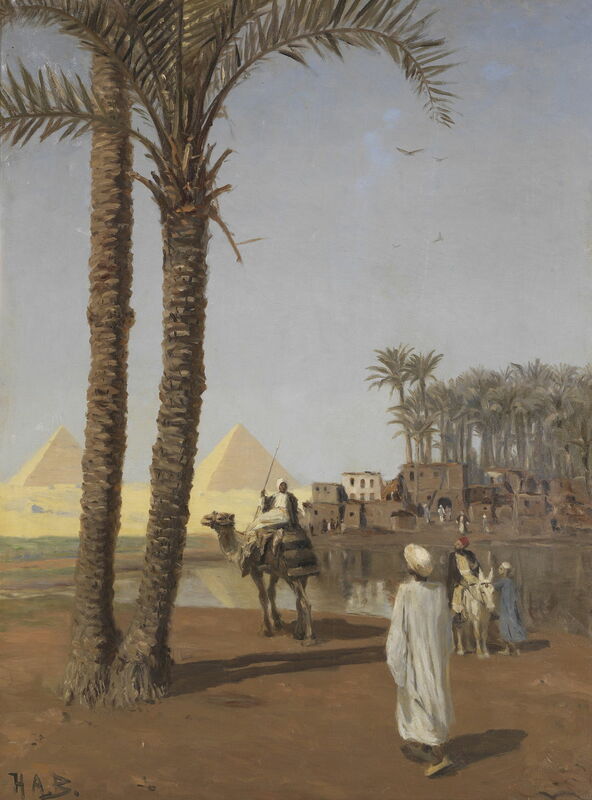 This Oriental Scene with the Pyramids of Giza in the Background probably from about 1890 show one of the most famous sites just outside the city of Cairo. Hans Andersen Brendekilde (1857–1942), View from the Seine (1892), oil on panel, 23.5 x 33 cm, location not known. Wikimedia Commons. 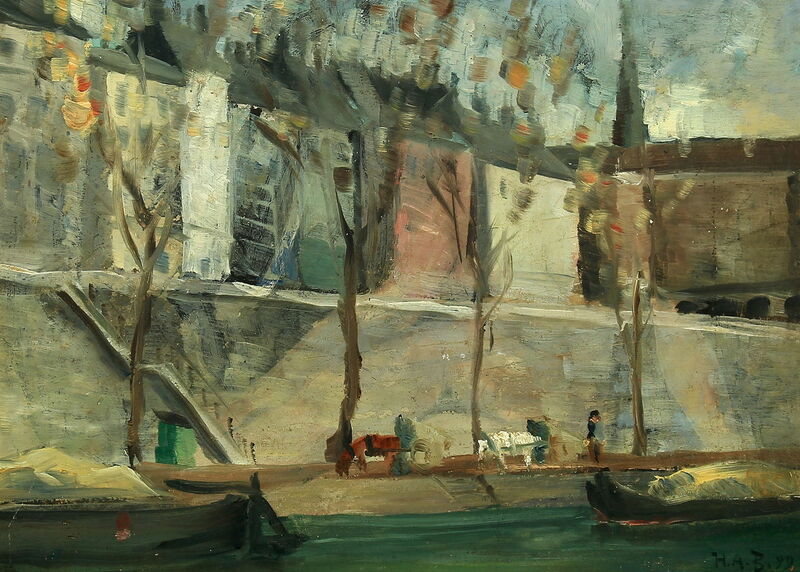 This small and very sketchy panel showing a View from the Seine is claimed to date from 1892, but may be from 1899. It shows a very different and thoroughly modern style, and must have been completed in a matter of minutes, perhaps as a quick oil sketch from a boat. Hans Andersen Brendekilde (1857–1942), Children on a Country Road, First Steps (1892), oil on canvas, 125.7 × 127 cm, location not known. Wikimedia Commons. Back in Denmark, Brendekilde returned to his Naturalist motifs. 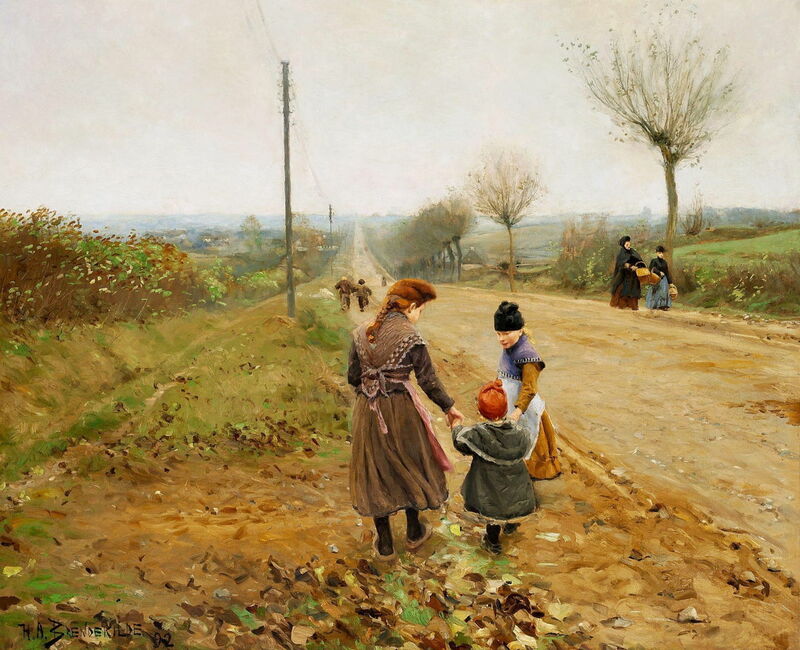 Children on a Country Road, First Steps from 1892 shows a mother and older child walking a toddler along the side of a road on a chilly late autumn day. The pollarded trees are almost bare of leaves, and the long straight road seems to stretch uninterrupted to the horizon. The telegraph poles are an interesting addition. 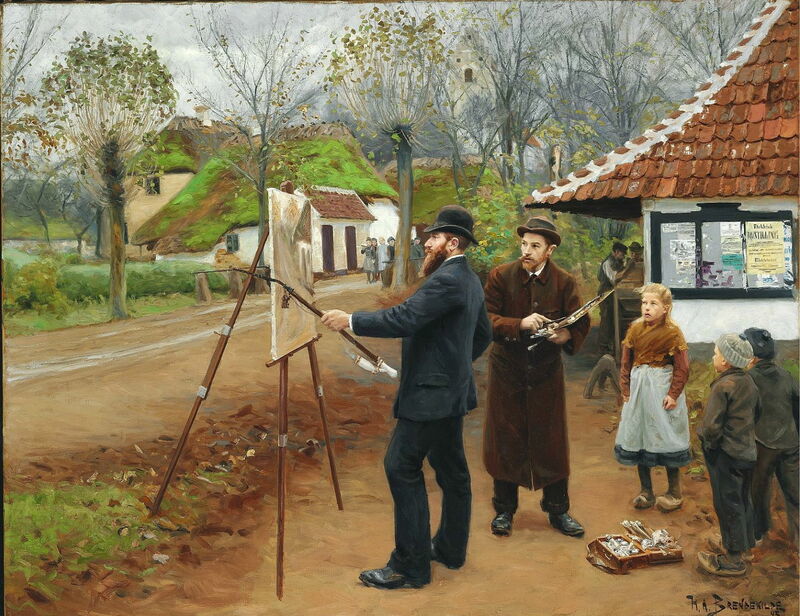 There’s a more complex story behind another of his road paintings, People by a Road from 1893. The group at the left are old road-workers, breaking larger rocks into coarse gravel. They may well have lived out under the wooden shelter behind them, as they slowly made their way along the road. Standing and apparently preaching to them is a cleanly-dressed carpenter, his saw held in his left hand. The building behind them, on the opposite side of the road, is a church, from which a large congregation has just emerged. Hans Andersen Brendekilde (1857–1942), L.A. Ring Paints at Aasum Smithy (1893), oil on canvas, 107 x 140 cm, location not known. Wikimedia Commons. In 1892, as I will explain in my next article, L A Ring’s friendship with the Wilde family was dissolving. By the following year Ring and Brendekilde were back out painting en plein air together. Brendekilde’s L.A. Ring Paints at Aasum Smithy (1893) is sometimes mistakenly thought to show someone else named Aasum Smedje. In fact, the building behind Ring, who is wearing the long brown coat and holding his palette, is the smithy in the village of Åsum (or Aasum), to the east of Odense in Denmark. Ring’s painting is of the primary school, which is off to the left. Ring is already suffering the attention of a small group of children, and a well-dressed man in a bowler hat (a local teacher, Lars Ebbesen) has now decided to give the artist the benefit of his opinion, with the aid of his huge pipe. Ring looks on nervously as his critic tells him what he has got wrong. By Ring’s feet is his pochard containing modern tubed paints, which made painting outdoors so much cleaner and simpler. Tomorrow I will show L A Ring’s paintings from the same period. Posted in General, Life, Painting and tagged Andersen, Bastien-Lepage, Brendekilde, Denmark, naturalism, painting, realism, Ring. Bookmark the permalink. I find these interesting – from their historical context as well as the combination of colours.